Strawberry season is here! What better way to spend a hot summer afternoon than hanging out with friends, barbecuing and drinking margaritas? I am rather partial to fruit margaritas, especially strawberry margaritas, which this tequila recipe is fantastic in. It’s best to start it soon so you’ll have it on hand by the time Summer starts. 1. 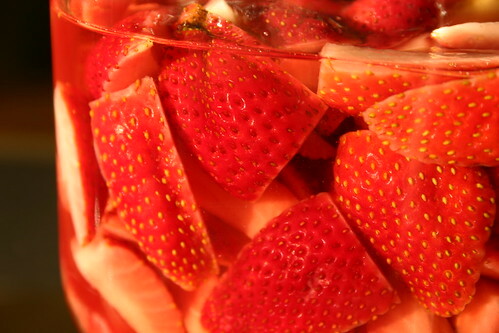 Put all ingredients in glass container making sure that the tequila completely covers the strawberries. 2. Cover tightly and store in a cool, dark place for 30-45 days. I like to mix the tequila soaked strawberries with an equal amount of fresh strawberries and make tequila strawberry preserves. So my fiance is going to freak when he sees this. As soon we can start picking the berries we're making this!